​St. Charles Borromeo Catholic School in Bloomington, Indiana provides an education of the highest academic and moral quality to nearly 420 students in Pre-K through 8th grade. Through diverse programs, St. Charles instills in students a sense of justice, charity, self-worth, and dignity. 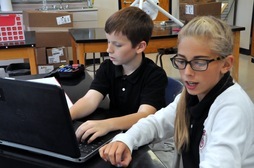 ​Why St. Charles School? Read more. Scholarships available. We work with every family to make Catholic education possible. Learn more. Visit us. Schedule a tour. Parent resources. View all the information and resources for our school. St. Charles offers year round, full time childcare for children ages 6 weeks to 3 years old. Set in a true school environment, children benefit from a progressive curriculum that is proven to provide an easier transition to Kindergarten. ﻿OPPORTUNITY IS AWAITING FOR YOU!